Why and How Do Cats Play? 1 Why Do Cats Play? 2 How Do Cats Play? 4 What Can You Do To Help Your Cat Play Safely? Cats are very interesting animals. They think and act very differently than us so I wanted to take a moment to explain exactly why and how cats play as well as a few other behaviors they exhibit that are in some cases opposite than what we think they mean. Before I answer this question, I want you to answer it for yourself. Do you enjoy play? Ok, maybe you might not think of it as ‘play’ but do you have hobbies and activities you enjoy outside of your job, parenting and other life’s responsibilities? Likely you do, even if you don’t have time to actually do them. Well the same goes for your cats too. They also like to play even as adults. Even though they are calmer and might even spend a lot of their time hidden away. Cats play for a couple of reasons. They just want to have fun but also to sharpen their hunting skills. In order to understand your cat better, rewire your mind to think hunter. Think like a huntress and you will understand the predator-centric beauties a lot better. Cats play in a number of ways. They get very passionate about their play too which can be entertaining at one minute but totally disturbing the next. And so on. When adult cats really get into playing is when you will really appreciate having invested in the best cat climbing structures for them. 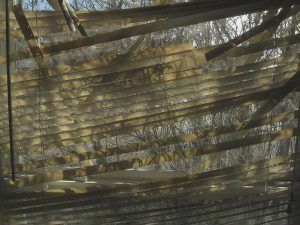 They can get very destructive which is something I know from experience is very costly when they don’t have the proper equipment to use. And the list goes on and on. Make no mistake, these things get completely destroyed which is why I use the term shredded because that’s exactly what happens. There’s no, ‘oh, that’s just a scratch, aww, its ok kitty’ about it. On that note, scratching posts are nice and they will scratch some of them but they do nothing to solve the damage from playing. Now, before you go off panicking and take your cat to an animal rescue, this little big issue is quite easy to solve. You just have to get the right equipment for your fur baby. Notice that I used the term ‘safely’ instead of ‘happily’. One way or the other, your cat is probably going to be happily exerting its energy whether it’s demolishing your house or not. The thing is, apart from financial strain, you are also putting your cats in danger by just letting them tear through your home. Think about it. If your cat is jumping on your stove, she might accidentally turn on the knob and burn herself or cause an even bigger problem. And please, believe me, my cat has done this before but luckily we caught on before our house burned down. What about climbing the blinds? She might get tangled in it and get strangled. I know its hard to hear but its very true and I hope you will take it in stride. Another effect of cats not getting to play properly is that they might exhibit trouble behavior. For instance, she might become more aggressive or poop all over the floor. And I’m sure you know this already but let me be frank, cat urine and poop (you can think explicitly if you want) stinks!! The actual behavior depends on the cat and how they react to stress much the same way as it differs with us from person to person. Nevertheless, we don’t want any of the above to occur if we can do something about it. 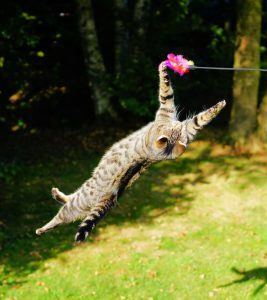 What Can You Do To Help Your Cat Play Safely? The good thing for us cat parents, there are great solutions. All you need to do to provide your cat with safe areas to play is to find cat trees that it likes. I strongly recommend getting wall-mounted varieties because they are sturdy and don’t take up any extra space. This is a huge bonus if you live in a small area like a condo, apartment, or small house. Click here to learn more about wall-mounted cat trees. 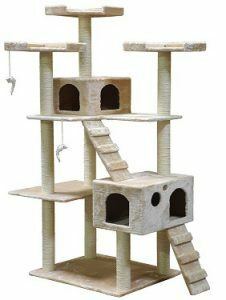 If you are looking for a free-standing cat tree make sure that it is sturdy and doesn’t wobble. Sometimes this means that you will have to get a more “expensive” model than the cheap $50 ones that are so popular on Amazon. If you are planning to buy one from a pet store, don’t. I’ll show you exactly the kind you need that costs the same (or even less) but you’ll be getting a much better quality out of your dollars. But please, let’s not get hung up on price alone. Always remember, an ounce of prevention is worth a pound of cure. Taking the time and effort to save money(if you have to #noshame) and buy the right cat tree will help you to avoid harsher financial burdens in the future such as vet bills, replacing expensive furniture or costly home repair (cats do tear up drywall too). For instance, I know personally, I’ve spent anywhere between multiple hundreds into the thousands at the vet alone on situations that, had I been properly educated and actually did what I learned to do, could have been avoided. Knowing that makes a cat tree, even a couple hundred dollars, well worth it. At the end of the day, it is up to us to provide a healthy and happy environment for our pets. I hope that this article has helped you understand your precious kitty a little better. If you have any questions, comments, requests or other feedback please don’t hesitate to leave a comment in the comments box below and share this information with others on your social media as well. Click Here To See Some Unique Cat Trees Your Cat Will Love! I do not own a cat but my daughter does and i have always wondered why they are always wanting to play so this post is answering my question. I love watching him come into my garden and play with the leaves when they move with the wind it is fascinating. One thing i do not understand is when the cats are making funny noises to each other, are they ready to fight ? or just talking to each other? as sometimes it sounds like there is going to be a big cat fight. Hey Sharon, great question, lol. Cats communicate with each other in many different ways. The interesting thing about cats is sometimes their more ‘aggressive’ behaviors are actually signs of affection. It really depends on the situation. Notice their body language and tail movements. If their tails are flinging back and forth vigorously, they’re likely irritated. If it is going back and forth more calmly they’re probably playing. No worries cuz mine are the same way. Biting is a normal sign of affection for cats so its a little emotion provoking to watch them do it. Just make sure no blood is being drawn, then that is a problem. 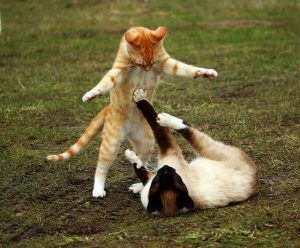 Great tips and information on cats play, I know from my own experience the damage cats can do in a home during their playing. When I moved into the home I live in now for the past five years there were signs of kitties who once lived here before me. I believe every cat owner should invest in a cat tree and other play toys for their cats to be happy and safe, it also will save on damage to your home as well. Hey Jim! Thanks for the comment. Your Millie sounds like my Midnight. She’s serious in her play too. Like a true huntress, lol. Hope Millie enjoys her new tree and thanks for sharing a little piece of your kitty experience with use 🙂 Have a nice holiday! Thanks so much for this delightful article on why and how cats play. I have a siamese and he is quite the athlete when he plays. He jumps on the kitchen counter, then on top of the fridge and then on top of the kitchen cupboards and runs back and forth growling. A cute growl. A play growl. If it’s not the kitchen he jumps from the living room chair on top of the china cabinets and does the same thing! Do your cats do that?